Details at the end of this post on how to enter to win an ebook copy of this book, and a link to purchase it from Amazon. All our giveaways this week are ebooks in honor of Earth Day! Harper Hathaway felt stifled in her hometown “lost in a sea” of family and friends, so after her high school graduation, she took a major leap of faith to seek who or what she she wanted to become. Her first venture was to enlist in the military, but after three full contracts, promotions, a stellar career, and good prospects for the future, she left to following her heart…and a handsome scuba diving instructor. Her new venture led her to travel to exotic destinations, even participating in exciting salvaging projects. Life was great until a tragic accident put her on the road…alone. With the city skyline shrinking in her rear view mirror, Harper heads north along the California coastal highway. Harper earns 5/5 On-the-Run Adventures…Exciting and Engaging! Momentarily distracted, Harper swerves her car to miss a dog causing her to end up in a drainage ditch. Dazed, but not injured, she exits quickly to check on the dog. More like a puppy, she quietly tries to entice the yellow Labrador toward her so she can check for any injuries. The skittish puppy balks at her efforts limping toward a car further down the embankment. Indications are the accident was very recent, and the passengers are seriously injured. Harper is shocked to see a baby in the back safely secured in the car seat. “The baby. You need to hide the baby. Hurry. You must leave now. Don't trust anyone. It's up to you to keep the baby safe.” The injured driver is emphatic. She takes the child; the puppy follows. But, it's what she witnesses next that causes her the most fear. Uniformed. Gunshot. No survivors. Her purse, phone, registration taken from her car. Fleeing the scene, Harper manages to find a way to contact close friend/ex-cop/PI Ben Holiday who puts her in touch with Michael Maddox, tech wiz. Together they cross the country unsure about who or why they are being pursued, but determined to find out. Wow! This is an exciting introduction to Kathi Daley’s newest series focusing on the second oldest of the five Hathaway Sisters. The drama is well-written with some nail-biting suspense, close calls, baby diapers, and puppy angst. Kathi’s signature writing style is on full display with vivid descriptions, well-developed characters, and entertaining banter, and this time with a third-person narrative. She has strayed from the traditional cozy formula in this book; it is more of a suspense thriller with the accident, the murders, the murderer, victims’ and child’s identity and backstory all known elements. It's the details, the why, and even a few surprises that kept me totally engaged. In between evading possible CHP, DEA, or maybe a drug cartel, Harper and Michael exchange insights about family, personal traumas, and feelings opening up to a budding…friendship? Romance? Family always plays a part in Daley’s books, so when their adventure returns them to Moosehead, Minnesota, readers get more compelling insights into the dynamics of siblings, good and challenging. This is definitely one of Kathi Daley’s best. Come for the Murder, Stay for the Romance! 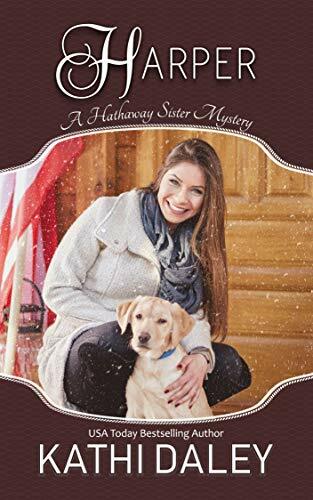 Kathi Daley has added one more to her long list of delightful series offering something for every cozy taste always including “fur” friends and close relationship between family and friends. The Hathaway Sisters Mystery begins with Harper, but fans need not wait too long for Harlow releasing in early May (check pre-order) and coming soon is Hayden. However, Harper has four sisters, so we can hope Haley and Haven will make an appearance this year. She has a great social media community of fans and can be followed on Goodreads and BookBub. To enter to win an ebook copy of Harper, simply email KRL at krlcontests@gmail[dot]com by replacing the [dot] with a period, and with the subject line "harper,” or comment on this article. A winner will be chosen April 20, 2019. If entering via comment please include your email address. You can read our privacy statement here if you like. Nerdsrgood (at) msn (dot) com. I read the first chapter and the book grabbed my attention. I love her books. Love your books, I am sure this one will be great too! Love Kathi Daley's books. Looking forward to reading "Harper". Sounds fantastic! Thanks for the opportunity! Loved the 1st chapterchapter; can hardly wait to read the rest of this book! Never read this author's books but would like to. Thanks for this opportunity to win, read and review your book. I hope to win. Thanks for this opportunity. My email is don(dot)stewart(at)zoominternet(dot)net . Thank you for a chance. Sound really good. Oh my, this sounds like a great book. I'm hooked. Thanks for the chance to win a copy.